Sporting a waxed, pointed moustache that spans 45 centimetres, an Ottawa man claimed a top prize at the World Beard and Moustache Championships in Oregon. 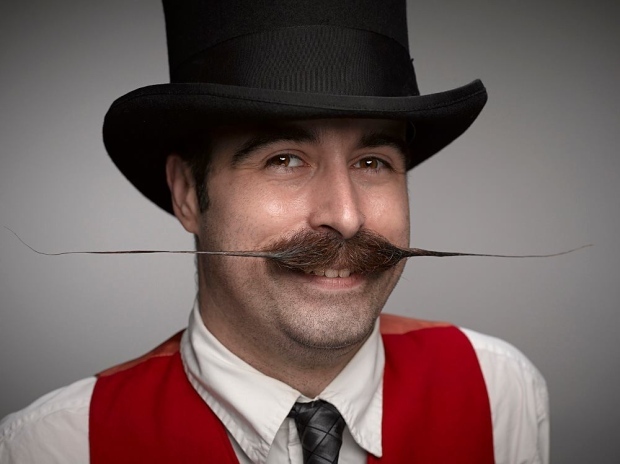 Colin Geitzler, who competes as Snidely Mansfield, took home the gold medal in the English moustache category while competing against more than 300 other competitors from all around the world over the weekend. It was the first time Mansfield has ever competed. Many of the competitors were from Oregon and Washington, but almost every U.S. state was represented and others flew in from countries as far away as Iran. "English moustache is the category I tend to wear (for competitions)," Mansfield told CTVNews.ca. "I fell into it (the style). I basically just waxed the moustache the best way. It doesn't like to curl much. I would say it found me." Mansfield said he first grew out a full beard two years ago for a Halloween costume and then decided to keep the moustache for Movember. Within a couple months he was able to wax and style it. On a regular day he may curl the tips around his ears, but for events, such as a wedding, he wears it English style. "I've been a hairy guy for my entire life and for a good portion of my life being hairy was uncool, but now it is completely acceptable and I find it a beautiful thing," said Mansfield. "Popularity (of growing facial hair) is definitely growing… The wonderful thing about facial hair is that it, in itself, is expression." Mansfield hopes to continue his winning ways and plans to compete in The World Beard and Moustache Championships next year in Austria. "The Europeans are really huge about competitive bearding," he said adding that many others from the Ottawa Facial Hair Club and Beard Team Canada plan to join him. In the meantime, Mansfield and other members of the club are hosting the capital city's first beard and moustache competition at the end of November. Besides the competition, it’s also a fundraiser for Movember and diabetes.